What a beautiful tradition. Americans are so less refined and cordial. We could learn a thing or two or a million from the Europeans. Thanks! !.i didn't know that.from the lily...........nice thought !! My DH bought me a pot of muguet yesterday as he does every year. When it has finished blooming I plant it in a flower bed by the front door ready for the following year. Sadly he dropped the flower pot whilst unloading the groceries from the car and my muguet is looking very sorry for itself this morning. how I envy you dear! Oh cool! I looked it up and it is sort of like our Labor Day. Very neat. Happy "Labor Day" to you! 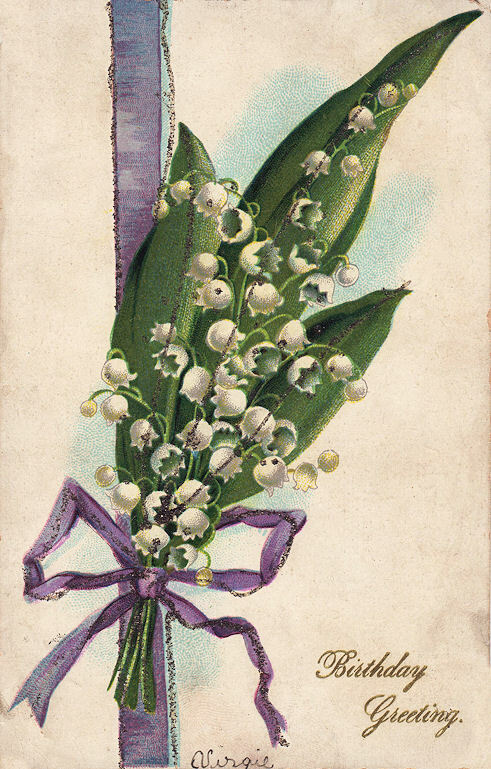 I love Lilly of Valley. Such a beautiful flower. You are so sweet, as usual! Hope you are having a great weekend! I love Lily of the valley!! So pretty!! That is a sweet tradition. I like it. What a beautiful tradition. I'd not heard of this one. I will remember this for next year so I can give some to my French friend who lives here in the states.